On 23 April 2009 I reported the sale of the 34.5m motor yacht Paola by Michael White and Peter Thompson at Ocean Independence and now Mike tells me she's back on the market under the new name of My Max through him and Peter. Delivered by Codecasa in 2000, My Max has emerged from a six month top to bottom refit, including a full repaint, all new audio-visual systems, a new interior and various substantial upgrades. This superyacht also recently passed her 10 year Lloyds survey. 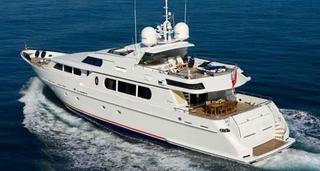 Accommodating up to 10 guests in four staterooms, she's asking $11.9 million.